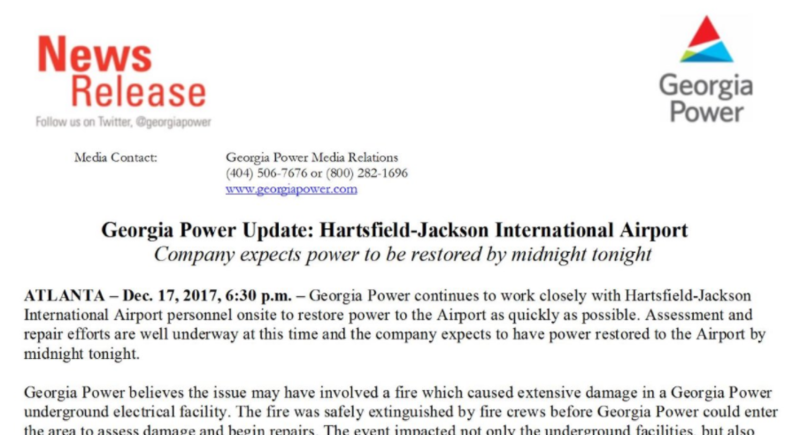 Could a Total Power Failure at the World's Largest Airport Have Been Avoided? Backup systems for electric power are commonplace. That was not the problem at ATL. The biggest problem around this incident, according to an Atlanta journalist reporting in a blog at Reddit.com, is that the backup system and the primary system were physically adjacent. When fire destroyed the primary system, it also destroyed the backup system. The last item is where we focus. Our nearly four decades of experience supplying fiberoptic monitoring and control equipment to power utilities, college campuses, theme parks, and airports around the world makes us uniquely qualified to supply the equipment that ensures communication redundancy and reliable monitoring and control of critical power systems and switchgear. The following links to articles document a few of our engagements over the years. TU Electric upgrades facilities and employs H&L Instruments fiberoptic control/monitoring equipment at Dallas Fort Worth International Airport to provide primary and secondary power for routine and contingency service. H&L Instruments fiberoptic networking gear integrates with GE Harris switchgear at Dallas Fort Worth International Airport, to reduce power failure downtime from hours to seconds. At the University of Santa Barbara campus, H&L Instruments model 570 uses a redundant ring topology that self-heals and reconfigures in 4 millseconds to two radial networks in the event of a node or fiber failure. Watertown Municipal Utilities (Watertown, SD) employs H&L Instruments model 570 for High Reliability SCADA Communication. Edmonton Power Distribution Company (EPCOR) deploys H&L Instruments 561-16 redundant loop technology for power distribution monitoring and control. If you are planning a system upgrade or new installation, give us a call. We are happy to share our experience and insights about SCADA fiberoptic networking, monitoring and control. You can read about other projects in our article repository.